While Alibaba’s growth from an apartment-sized company in 1999 to a company with the largest IPO value in American history in 2014 can only be high-velocity, founder Jack Ma’s taste for speed is relentless. 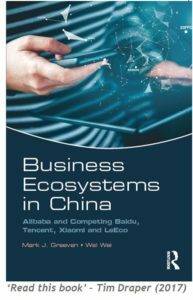 Since early 2012 Alibaba Group has shifted gears and moved from organic growth and partnerships to high-speed growth by M&As in complementary technology fields. It has been expanding in finance, healthcare, travel and even movie making. Alibaba has become one of the most signficant tech investors in China. Once it was revolutionary: online platforms that allow people to borrow each other money without the banks in between. By now, banks and institutional investors have become the largest investors in this form of crowdfunding. The profitability of companies should not be the only measure to assess whether or not Chinese companies should go global. Only when companies have established a management system with well-defined strategic goals, and the right management talent, they are ready to go. Lars H. is a current student of the Global Entrepreneurship Program. While attending classes at Zhejiang University he took a course called “Creativity, Innovation & Entrepreneurship” taught my Mark Greeven, Associate Professor in Innovation & Entrepreneurshipat Zhejiang University. See what Lars thought about this course. Creativity and entrepreneurship. These are the two pillars that the Chinese government focuses on, now it has become clear that the traditional economic model that made China big, does not work anymore. Students of the Global Entrepreneurship Program spend their second semester studying entrepreneurship at Zhejiang University School of Management in China, one of the top Universities in China. Mark Greeven, Director of the Global Entrepreneurship Program on behalf of Zhejiang University is an expert in entrepreneurship in China, having researched the topic for the past 11 years starting with his PhD project focusing on Chinese private enterprise at Rotterdam School of Management. We caught up with Mark about how the Global Entrepreneurship Program is unique in its approach to entrepreneurship education, the benefits of studying entrepreneurship at one of the top Universities in China, how students of the program develop after studying and working across 3 continents and how students can learn to be entrepreneurs both inside and outside the classroom. When Vivat (from brands such as SNS Reaal and Zwitserleven) announced it has agreed with a takeover by Anbang, most people never heard of this illustrious and cash-rich Chinese company, let alone the founder Xiaohui Wu, who founded the company only 11 years ago. Telecom giant Huawei, car maker BYD, insurance software developer eBaotech, and diary producer Yili are among the many that have set foot in the Dutch market. Many of the overseas Chinese companies are not state-owned but privately owned, founded and run by star entrepreneurs, who gain celebrity status in China. A sustainable economic development of China depends on innovation. Moving from an unsustainable export- and investment-led growth towards sustainable economic development based on domestic consumption requires catching up in terms of productivity and living conditions. The Chinese government is well aware of the fact that the ecosystem for innovation in China is still immature and in need of significant changes. Well before the Communist Party’s Third Plenum in November 2013, the “National medium- and long-term plan for the development of science and technology (2006-2020)”, issued by the State Council, outlined China’s broad ambition to enhance innovation with around 100 supporting policies and the goal to increase R&D spending to $113 billion by 2020. The Third Plenum addressed the issues around creating a favorable environment for innovation in four main ways. Chinese e-commerce giant Alibaba has a track record of breaking records. It not only operates the world’s largest online business-to-business platform, but also the world’s largest online consumer marketplace. In 2004, it had the largest initial public offering (IPO) since Google on the Hong Kong Stock Exchange. In 2014, Alibaba had the biggest IPO in US history with its debut on the New York Stock Exchange on 19 September. Its founder Jack Ma — the first mainland Chinese to appear on the cover of Forbes magazine — and his core team have, in just 15 years, built a Chinese private company that is a global force to be reckoned with. Jack Ma is not the only Chinese entrepreneur with potential and the world may need to prepare for a wave of global Chinese companies.